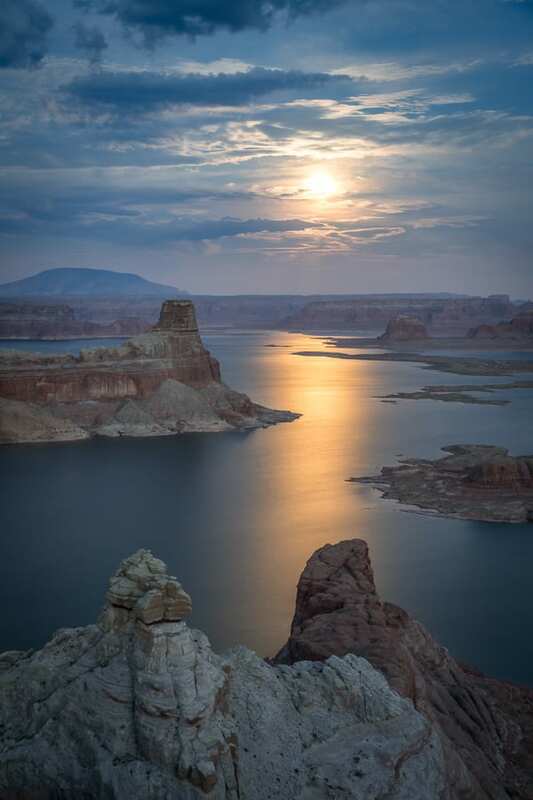 Lake Powell is one of the most iconic locations in the desert Southwest. We'll get you well off the beaten path and show you the most spectacular viewpoints of this amazing lake. This tour involves a lot of driving on rough roads, but very little hiking is required. You'll see many spectacular destinations on this tour besides Lake Powell. 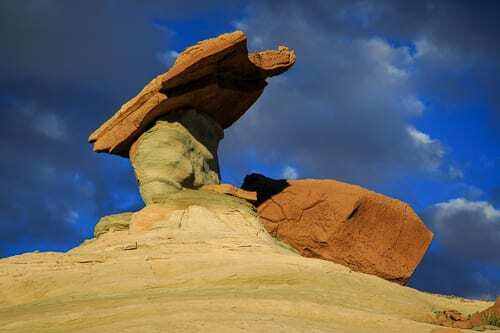 We'll pass through otherworldly badlands, rock hoodoos, alcoves, etc. We go out for the best light late in the evening and have even timed many outings with the full moon rise. Professional photography instruction is included on all tours. Milky Way outings can be arranged if interested. Drive Time: 2-2.5 hrs each way. Tour Meetup Location: The trip begins and ends in Kanab, UT. The address will be given in your confirmation email and is a safe place to park your vehicle. If you like, you can leave any valuables indoors. Once you arrive, we’ll ask you to load your gear and sign a liability release waiver. Las Vegas is the closest major airport to Kanab. There is no public transportation to Kanab, so you’ll need your own vehicle. We recommend that you stay in a hotel in Kanab the evening of your tour. There are many good hotels in the area like the Best Western, Hampton Inn, Holiday Inn Express, Comfort Inn & Suites, and the Canyons Boutique. Alternate Meet-Up Point: We often get requests to pick-up folks coming from Page, AZ. Since it is too far out of the way, we cannot pick you up in Page, but we will meet clients just a few miles east of town at the BLM Visitor Center in Big Water, UT. Pickup time will be one hour after the scheduled tour departure time in Utah time. If you want us to pick you up here, PLEASE CONTACT US AHEAD OF TIME TO MAKE ARRANGEMENTS. Note that the tour time will be 2 hours less since we won’t have the 60min drive time to and from Kanab. Permits: We hold commercial use permits for Glen Canyon National Recreation Area. Hiking / Fitness: This trip involves very little hiking so it is rated as easy. Just come prepared for some rough 4x4 driving! 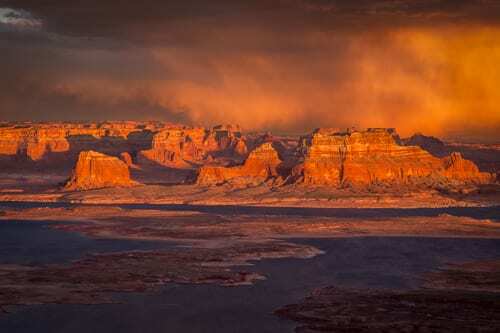 Weather Conditions: The weather around Lake Powell is usually pretty warm and sunny. However, storms and wind can pop up at any time, so make sure you come prepared. We cannot offer refunds due to weather unless we cannot go out at all. Don’t despise inclement weather – that is often when you get the most dramatic photos! Just make sure you dress and prepare adequately. It can get cold during the winter months. Road Conditions: The route out to Alstrom Point is very rough. But we'll make sure you get there safely in our well equipped 4WD vehicles. If it has been raining, the road becomes impassable due to sticky clay mud. Should that happen, we'll schedule an alternate destination based on group consensus (we have lots of amazing spots to choose from). Trip Itinerary: The exact tour itinerary is flexible based on the weather and current conditions. 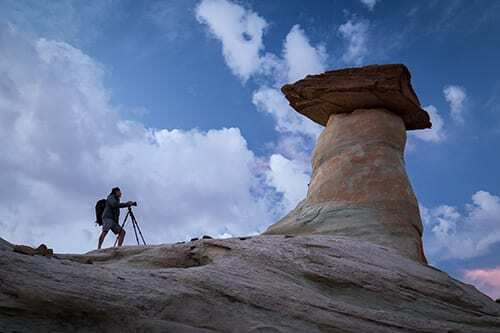 We add an additional side trip to every outing to photograph things like badlands, rock hoodoos, and caves. We'll show you spots that not many people photograph! Night Photography: We often get requests to do night photography during Milky Way season. If this is something you want to do, please contact ahead of time to make arrangements. You will be able to capture the full arc of the Milky Way over the lake March - June. Food/Water: We do not provide food on our outings. All participants should bring food/water to hold them through dinner. Many folks will eat their dinner during the drive back to Kanab. We will have a cooler where you can store food and drink. What to Wear: You should check the weather forecast prior to coming on the trip and dress accordingly (check Page, AZ). Note that the temperature can drop quickly after the sun goes down. Don’t forget sunglasses and sunscreen. Cell Phones: Bring your cell phone along! They are great for capturing candid images. Plus, most folks will have cell service where we go. There are USB ports in our vehicles so bring a charging cable if you need one. Moon: This is a fantastic place to photograph the moon. Book on the following dates in 2018 if you want the best moon shots: Feb 28, Mar 1,30-31, Apr 28-29, May 28-29, June 26-28, July 26-27, Aug 24-26, Sept 23-24, Oct 22-24, Nov 21-23, Dec 21-22. 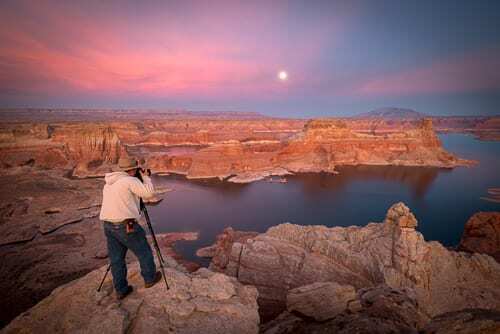 Camera Gear: You can make use of just about any lens on our Lake Powell trip. If you want to go to the tree cave, you'll need an ultrawide lens (i.e. 14mm). 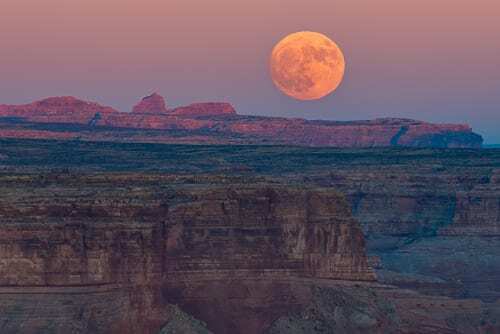 A wide angle zoom lens is useful when shooting from the canyon rim (equivalent 16-35 on a full-frame camera or 10-22mm on a crop sensor). A mid-range lens in the range of 30-100mm will provide nice scale and compression. Telephoto lenses will be useful for isolating rock formations in the distance. They are also useful if you're shooting the rising moon. Bring as many lenses as you like - just ensure your pack isn’t too heavy for comfort. All participants should bring a tripod. For filters, a circular polarizer can come in handy when there are clouds in the sky (it’s best to avoid polarizers on cloudless days). A neutral density filter can be nice to create long exposures for fast moving clouds and to smooth out any rough lake surface. Don’t forget extra batteries, memory cards, and cleaning supplies. Please contact us if you’d like to rent any camera gear for your outing.